PA chairman urges EU to recognize "Palestine" and pressure Israel to agree to a withdrawal to the pre-1967 borders. Palestinian Authority (PA) chairman Mahmoud Abbas said on Sunday that the “Deal of the Century”, a reference to the American peace initiative, and any other political plan that does not rely on international legitimacy resolutions will fail, if it does not lead to the establishment of an independent and sovereign Palestinian state with eastern Jerusalem as its capital. In a speech at the Arab-European Conference in Sharm el-Sheikh in Egypt, Abbas said that attempts by the US administration and Israel to normalize relations between Israel and Arab and Islamic states will not bring peace and security to Israel, and that the 2002 Arab initiative is the only way to achieve peace. Abbas called on European countries to take steps to bring about peace, first and foremost to stop the Israeli settlement enterprise, establish a two-state solution, recognize the state of “Palestine” and grant full status to “Palestine” in UN institutions. The PA chairman reiterated his call for an international conference on peace and the creation of an international mechanism to sponsor negotiations, and his request for European countries to define relations with Israel in accordance with the EU’s commitment to the principles of the peace process, the principle of a two-state solution within the 1967 borders and the principles of human rights and international law. 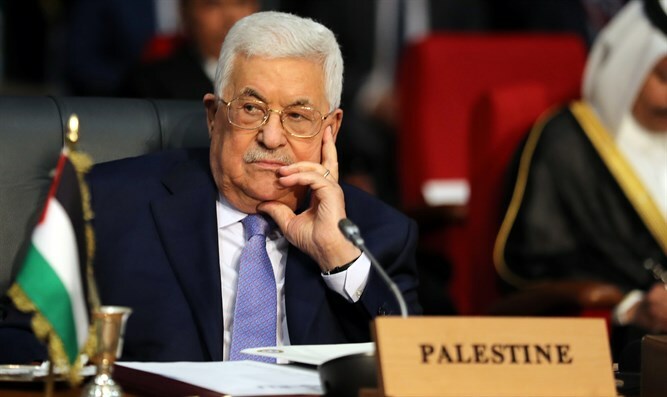 Abbas has rejected the US peace plan being formulated by the Trump administration, and which will be presented after the April 9 election in Israel, before it has even been unveiled.